When you’ve had a drought, like we have had lately in Oklahoma, thunder and lightning are a welcome surprise. My first thoughts this night were how incredible rain must have felt to the people in the Dust Bowl decade plus. I can’t even imagine living through that time and, having learned about it, now appreciate the rain even more. 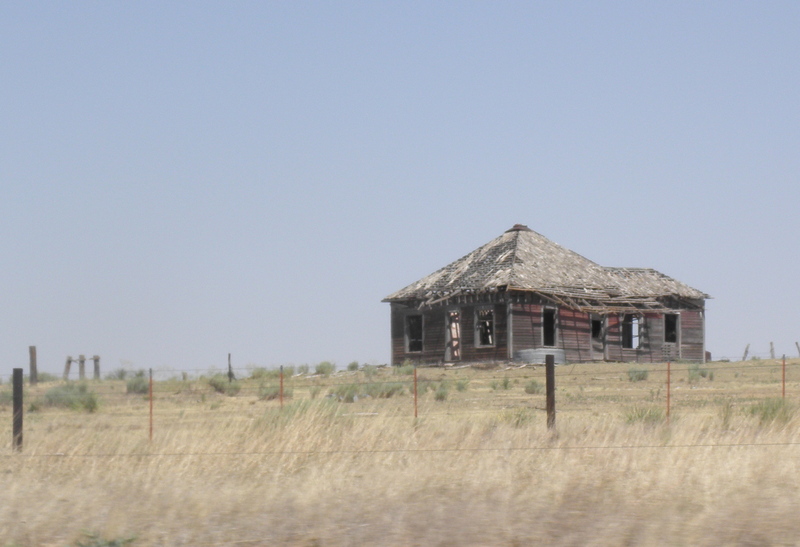 Here’s a remnant of a Dust Bowl house I passed in the Oklahoma panhandle, a lonely reminder of those who walked away. There’s Rain, Rain, Go Away…my favorite version other than us singing it as kids is Peter, Paul & Mary blending their incredible voices. Raindrops keep falling on my head…but I’m snugly inside tonight, not running outside to stomp and splash through the puddles in the summer, coming home soaking wet, like we did as children. It’s nice to remember times when rain wasn’t just a nuisance, something to escape so you weren’t trapped in traffic, worrying about getting your shoes and clothes wet, trying to keep from catching your death, as they used to say. Remember the fun times when we walked through it and laughed about it, played in it, rejoiced at dripping our way into the house to get warm and dry. When do we get too old to stop and look up at the rain and let it hit our faces? Remember that thrill? Anyway, tonight is blessed rain to help the farmers, nourish the trees and wash the dust off our winter lives. March showers bring spring dreams. 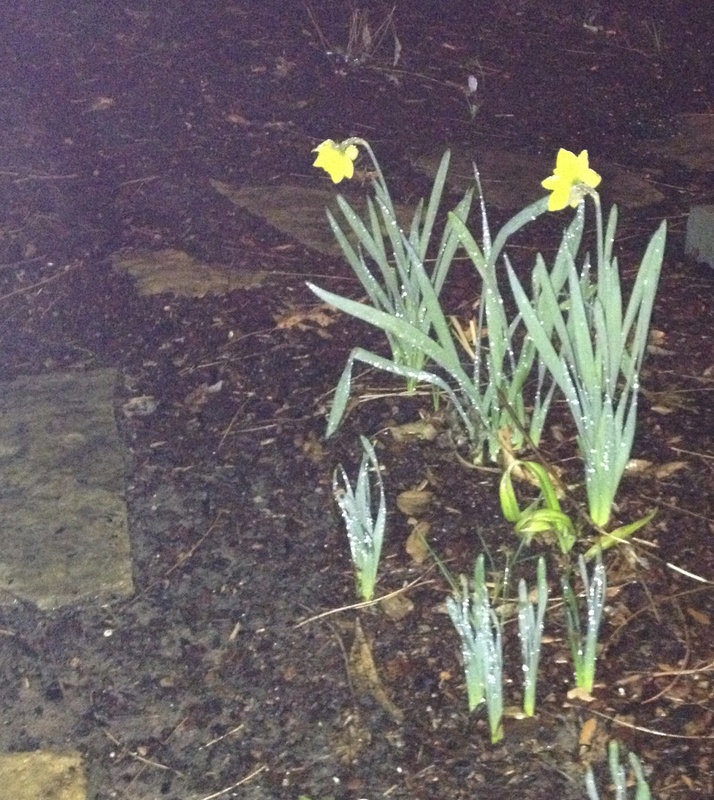 When I wake up tomorrow morning, these flowers in the dark will have soaked up the rain and blossomed in all their glory. Magic Mother Nature. Perfect Sunday morning finding you in my mail. Great read. I love the pic of the prairie house, the amazing poem, (which I will share with my little ones) and the memory of rain in the face. In OKC we turned faces upward to feel the rain….eyes closed, tongues out! Thanks for the memory. You are so awesome. This is my first of many days with you and I am the winner!!! I read the Birthday Cake and again, here came the memories. Your Alan was such a fun person to be around. The two of you together was perfect. Thanks you for sharing how you two fell in love. It sounds like you two were truly meant for each other, and you knew it was right! I had tears, so I thought I would save the next for another day. Oh yes, I love it that you still call your Daddy, “Daddy”. When I talk about my Daddy, I wonder what others think about using Daddy instead of Dad or Father. Forget it, like you, I also had a Daddy. Join you tomorrow, and thanks. Thanks, Gae! I think you’ll like the one I just posted as well. Lots of memories for us old folks!